Needed an idea for Valentine’s Day. No, it was not a last minute idea. I just wasn’t thinking very clearly. Finally, about a week ago, I got an idea. Stupid me..I drive by the Downtown Market in Grand Rapids everyday. Why not take advantage of some of the goodies. The first stop I made was at the first place you see when you walk in northeast doors. 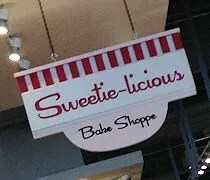 Sweetie-licious Bake Shop takes up some pretty prime real estate in the new indoor market right up front. The name, while new to Grand Rapids, should be familiar to fans of the Food Network. Sweetie-licious has had a cafe and bakery in DeWitt for many years and they’ve appeared on the Food Network multiple times and won the Amazing Pie Challenge on Food Network Challenge in 2009. 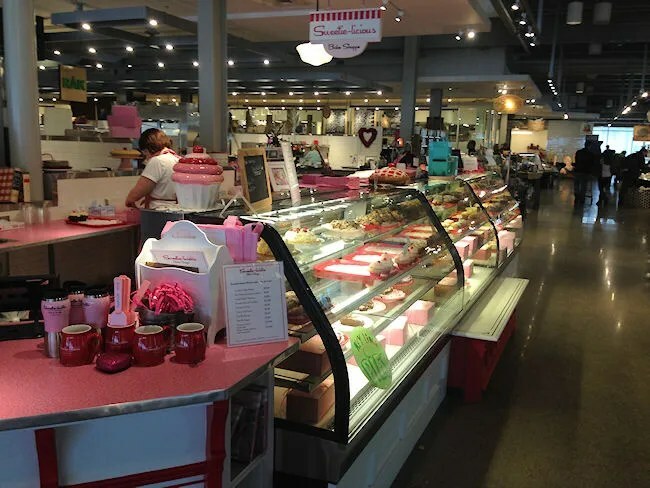 The Grand Rapids bake shop has an incredibly big display case filled with all sorts of baked goodies including pies, muffins, quiches, cookies, cakes, and cupcakes. I headed straight for the cupcake section. Who doesn’t love an awesome gourmet cupcake? I knew J would love it. They only had a couple selections left late in the day. One of them sounded delicious (red velvet), the other I don’t think either J or I would have really enjoyed (Carrot Cake). 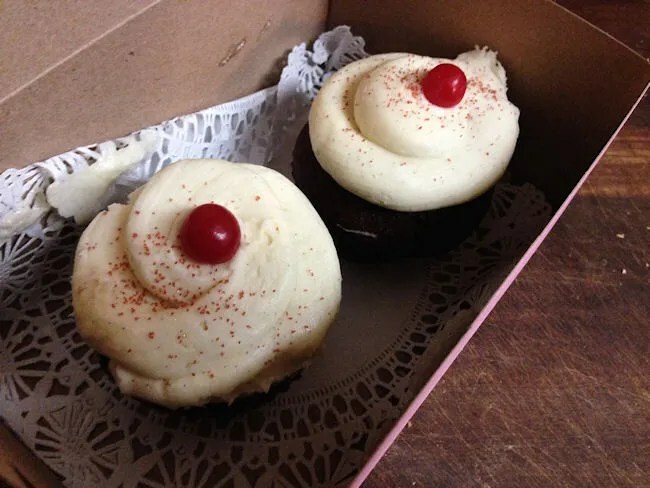 I asked for two of the red velvet cupcakes hoping J would share at least half of one with me. I wouldn’t blame her if she didn’t, but there’s always hope. The two cupcakes were boxed up in a pink box that also bragged about their many, many awards. The cost was right around eight bucks which I paid cash for so J wouldn’t see the charge show up on the credit card before I was able to surprise her with the sweets. Due to our schedules, J and I kind of pass in the night and don’t really see each other. When I got home, J had left a very sweet card for me on the table and I did the same with her present. She took the cupcake to work and ate it for breakfast. When we did finally see each other at about 2:30 on Friday afternoon, I asked her how it was and she said it was delicious. 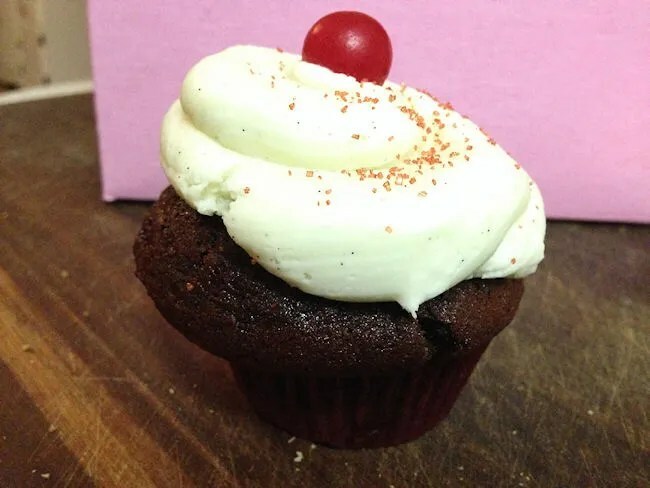 She loved the stiff, creamy frosting that mounded up pretty high on top of the red velvet cupcake. Without my even asking, she offered to split the second cupcake three ways and I took her up on the offer. She was right on with her critique of the frosting. He was so creamy and sugary delicious. By this point, the actual cake was probably at least 24 hours old, so it did dry out some by the time I got to it. It was still a really great Valentine’s Day treat. For as long as the Market has been open in downtown Grand Rapids, I have not yet taken full advantage of working so close to it. Sure, I’ve stopped in for tacos a few times, but there’s so much more and I need to keep exploring. Sweetie-licious is a great option to pop in for a quick treat and one that should be taken advantage of more often.